When DangerZone Industries had released the latest and greatest Virtual Reality MMORPG, James, and millions of other virtual reality players, sought purpose and self-definition in this new world. The tag line “Live the life your soul was meant for,” captured the hearts and minds of his entire generation. “The Land,” was the largest and most dynamic virtual reality game of all time. James and his friends had devoted countless hours to become one of the top teams in the game. None of that mattered after James was actually summoned to The Land. What had been an engrossing game became a daily struggle of life and death. James struggles to survive while becoming embroiled in an age old war between the sprites and goblins, avoiding the machinations of the local king and helping an enslaved woman know freedom once again. Also see this review of The Land: Founding at Geek Dad. 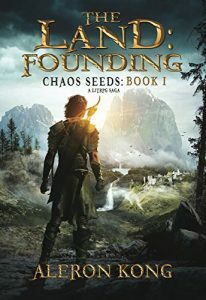 Here’s a look at the other books in this LitRPG series from Aleron Kong.